With our investing account you can access 15 of the largest stock exchanges at no cost. 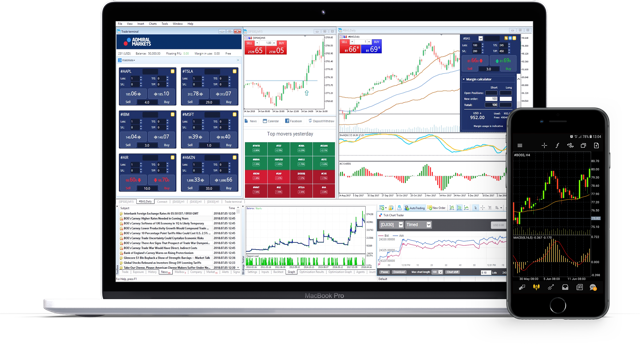 Trade thousands of stocks & ETFs and manage your portfolio on the powerful multi-asset platform — MetaTrader 5! Our offering includes exchange-traded funds and single shares from 15 stock exchanges around the globe. *The offer may vary for retail clients. Receive the current market price information for all the available instruments without any delays and at no extra cost. Get Dow Jones Newswires market news and insights you can trust, straight into your trading platform. Choose your next investment opportunity from thousands of shares listed on 15 of the world`s most prominent stock exchanges. Open an Admiral.Invest account with as little as €500. No monthly maintenance fees charged. Trading fees start at $0.01 per share with minimum transaction fees of $1 in US stocks. Create a stream of potential passive income with a portfolio of dividend-paying stocks. Every time a company pays dividends, you will receive a proportional amount according to the investment in your account. Research, back-test and automate your strategy in MetaTrader 5 – a powerful multi-asset charting and trading platform for desktops, web browsers and mobile devices. MetaTrader 5 Supreme Edition is the latest masterpiece of the all-in-one, multi-asset trading software. It is packed with advanced charting features and tools to automate and boost your trading experience across all available markets. Lighter versions are also available for web browsers, Android and iOS mobile devices. Try it for free on any device of your choice! It’s easy, quick, and convenient! If you have questions about Admiral.Invest, we have the answers! Check out the Frequently Asked Questions below. If you don’t find the answer you’re looking for, reach out to us for more information via any available support channel listed below. How is Admiral.Invest different from other account types? Admiral.Invest is an account type designed for investing in publicly listed stocks and exchange-traded funds (ETFs). Investors make transactions on a cash basis and not on a margin basis. Technically speaking, investors have to post 100% of the transaction value to buy an asset, which translates to a leverage of 1:1. In Admiral.Invest accounts, there are no margin calls or Stop Out levels as long as there is no leverage. Here is a link to a comprehensive comparison and detailed description of our trading account types. Why is Admiral.Invest based on the MetaTrader 5 platform? MetaTrader 5 is a modern and greatly enhanced version of its predecessor, MetaTrader 4, and is particularly specialised in supporting large and multi-asset instruments coverage. With all the features inherited from the world’s most popular trading software, MetaTrader 5 provides a unique experience for investors by bringing you the fullest range of features from the trading world, including the possibility of automating your strategy, backtesting, advanced charting and access to financial news. In addition to the in-box features of MetaTrader 5, we’re also offering you our renowned MetaTrader Supreme Edition​, which represents an even more advanced and deeply customised desktop version of MetaTrader that provides a variety of additional useful functions. Who can open an Admiral.Invest account with Admiral Markets? The Admiral.Invest account is available to all our clients who accepted general terms and conditions and other related terms of service of Admiral Markets. There is an additional minimum funding requirement of €500 in respect to the Admiral.Invest account. How does investing in exchange-traded funds (ETFs) differ from investing in stocks? Technically, the process of buying a share in ETF and buying a single stock within the Admiral.Invest account is exactly the same. The difference between these two instruments is the extent of investors’ exposure to a particular market or sector of the economy. Whilst some companies are more successful than other direct competitors, the investor’s portfolio of a single company stock remains solely reliant on the performance of the management of this company. At the same time, ETFs offer investors the possibility to diversify issuer risk related to stocks and to gain exposure to the entire sector of the economy, as if the investor was buying stocks of all the relevant companies of this sector. Instead of making dozens and even hundreds of transactions in the stocks of relevant sector companies, an investor may choose to buy a share in the thematic ETF by executing a single transaction, thus saving on trading fees and gaining the desired exposure level. Can I transfer my portfolio of stocks from other broker or bank to an Admiral.Invest account? Not at the moment, but we are working hard to enable this option for our clients in the future. How can I contact Admiral Markets? Our customer support team is ready to answer any of your questions. All you have to do is get in touch!